This annotated edition of Lewis Carroll's two most famous stories includes the original primitive text for Alice in Wonderland. the little girl Alice Liddell into a dream-story and found himself famous as the author of Alice in Wonderland (1865). Through the Looking Glass followed in 1871. In recent years Carroll has been taken quite seriously as a major literary artist for adults as well. His works have come under the scrutiny of critics who have explained his permanent attractiveness in terms of existential and symbolic drama: The Alice books dramatize psychological realities in symbolic terms, being commentary on the nature of the human predicament rather than escape from it. In addition to his writing, Carroll was also a pioneering photographer, and he took many pictures of young children, especially girls, with whom he seemed to empathize. Hugh Haughton is a senior lecturer at the University of York. 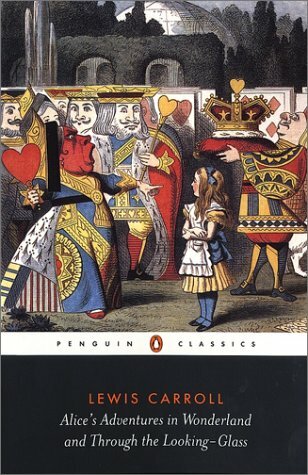 He edited Lewis Carroll's Alice's Adventures in Wonderland and Through the Looking-Glass for Penguin Classics. His specialty is in the area of Irish literature and the literature of nonsense. Haughton was born in county Cork in the Republic of Ireland and educated at Cambridge and Oxford. farewell banquet at which the Leader of the House of Commons, presided.